Wexford University’s summer session for its associate of arts degree in fitness training begins June 24. The online degree program helps prepare students for a career in the health and fitness industry. Summer school doesn’t have to take students away from outdoor time, family time or travel: Wexford University’s online associate of arts degree in fitness training offers flexible and convenient scheduling for sessions throughout the year. Registration for the summer session is open now and classes begin on June 24. 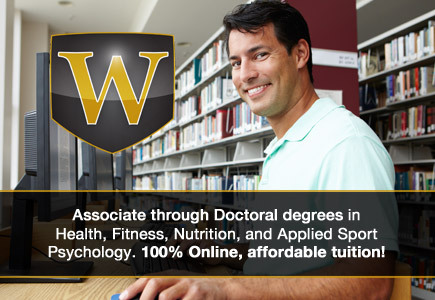 Students can learn more and register online at http://wexford.edu/degree-programs/associate-of-arts-degree-in-fitness-training/. Wexford University’s online associate of arts degree in fitness training prepares students for careers as a personal trainer, fitness coach, lifestyle consultant, fitness manager and other similar fields. Further, it can be used as a stepping-stone to a bachelor’s, master’s or doctoral degree in the growing fitness and wellness industry. The associate of arts degree in fitness training imparts a fundamental knowledge of the human body and how it responds to the stress of exercise, basic nutrition and its importance to overall health and wellness, and an understanding of the psycho-social factors that affect people’s ability to achieve their health and wellness goals. Online classes are taught by world-class instructors and offer affordable pricing and convenience.